Summer is ending for us in 3 days. We have had a great summer and just like everyone else, I feel like it flew by. It really does feel like Kamryn got out of school last week instead of almost 3 months ago. One of my biggest fears of the summer is the dreaded summer cold. It always feels worse in the summer. Late yesterday afternoon, I started to feel that unmistakeable feeling in my throat that signals the start of a cold. It’s been so hot lately, though, that I thought maybe I would just sweat it out. I have been burning the candle at both ends for about the last week so I went to bed early last night and slept like a champ. However, when Rory came in this morning at 6:30, I knew I was in trouble. I had just had 9 1/2 hours of sleep with only one wake up and I was still exhausted. In fact, when Ryan got up at 8:00, I was falling back asleep on the couch. I eventually got up and went out and laid by the pool while Ryan and the kids swam. I was sweating profusely and dipped in the pool to cool off which resulted in me getting the chills so I got back on my chair in the sun to warm up. After about an hour, I had had enough and went back inside, ate some lunch and fell asleep on the couch. 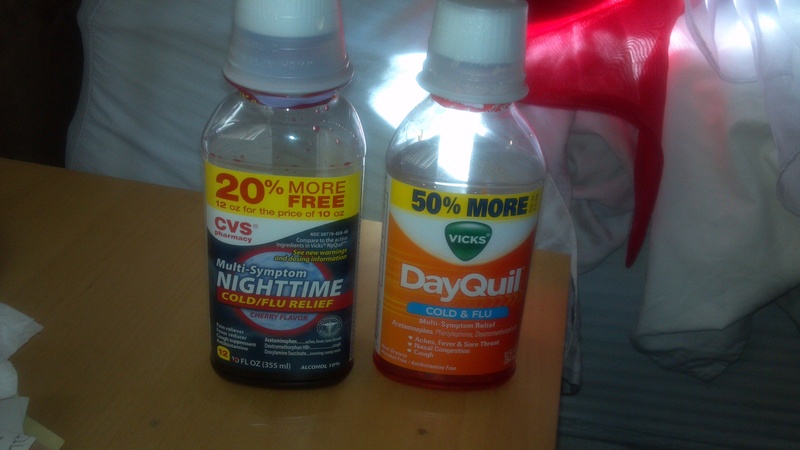 This entry was posted in Miscellaneous Ramblings and tagged Day Quil, NyQuil, Summer colds by Amy. Bookmark the permalink. Seriously, hope you’re feeling better. What *was* the movie though? More importantly, was it any good?? J. Edgar was the movie. I liked it…but does Leonardo ever make a bad movie? I have Inception recorded on my DVR, but haven’t had 3 hours to watch it. I believe I own The Aviator and I agree – it got weird. I’ll be better, but Kamryn will probably have about 10 new germs from school.